Please Note: One FREE Child (9 & under) ticket with the purchase of a regular priced Adult ticket all season long! (Available only at the time of the Adult ticket purchase). 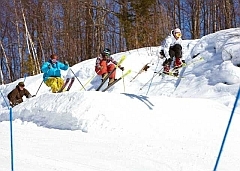 All children 6 & under ski FREE every day at Big Powderhorn Mountain. Lift ticket prices on our website are the only accurate pricing source. No other website prices will be honored. Our Rental Shop carries Élan shaped skis. We offer snowboards by Elan, Rossignol, and HEAD. We also give you the option of trying high performance rentals. Take a look at our offerings below. If you still have questions, don't hesitate to give us a call. HIGH PERFORMANCE SKI RENTALS Our high performance lineup includes upper level men's and women's specific retail packages. The skis are Élan shaped and twin tip models; boots are Nordica and Dalbello advanced ability four-buckle front entry; bindings are by Elan. The women's specific design has a different level of rebound and binding mount position to allow better response and control. ID required for all rentals. Ski and snowboard waxing and tune ups available in the Rental Shop. As an added bonus, you can get one FREE child season pass with each paid adult season pass. ( Midweek pass does not include a free child pass.) You could be bypassing the lift ticket lines and going straight to the lifts which sounds like a much better use of your vacation time. * Midweek Season Pass are valid Monday through Friday (excluding the holidays). However, with your midweek pass, you can purchase a weekend or holiday lift ticket for just $10! No Free Child with Midweek Pass. If you have any questions about any of our Season Pass options, give us a call at 800-501-SNOW (7669). We would be happy to answer your questions. $30 for your Lift Ticket. 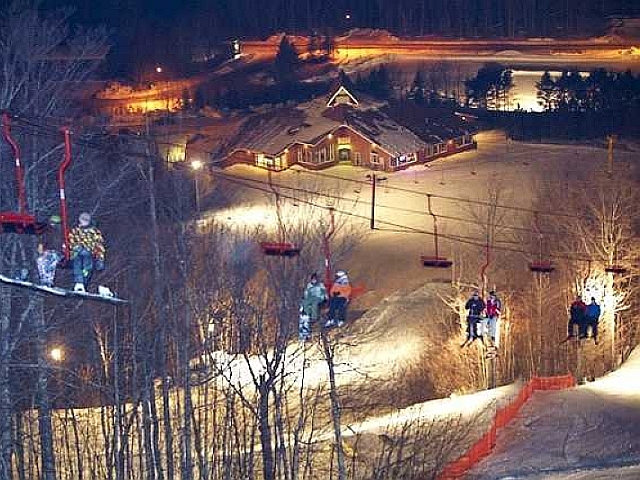 $ 5 Ski/Snowboard Rental - (with purchase of $30 Local Lift Ticket *). * Discounted local rental rates apply only with the purchase of a local ticket and not available with any other ticket options. Don't groan and roll your eyes - this isn't like going through third grade again. Lessons are very helpful if you are: new to skiing or snowboarding; wanting to master a certain technique; trying to dump a bad habit; trying to feel more in control or just wanting to enjoy your skiing/boarding more. A good technique "feels" as good as it looks - there's a reason those smooth riders are grinning ear-to-ear! The best thing a new skier/boarder can do is start with an introductory package that includes lesson, rentals, and lift tickets. Recommended for the first time or never-ever skier or boarder age 8 & over. Includes one lesson, ski or snowboard rental, and Beginner Slope lift ticket. Learn to stand, slide, stop, turn. Please call ahead for availability.